For two parents with demanding jobs in Silicon Valley, a quiet home where they could unplug was an ideal that they set out to achieve — despite the fact that they have three children. They wanted a comfortable place that was in tune with the elements, where warm summer days and cool winter nights could be enjoyed with equal opportunity. 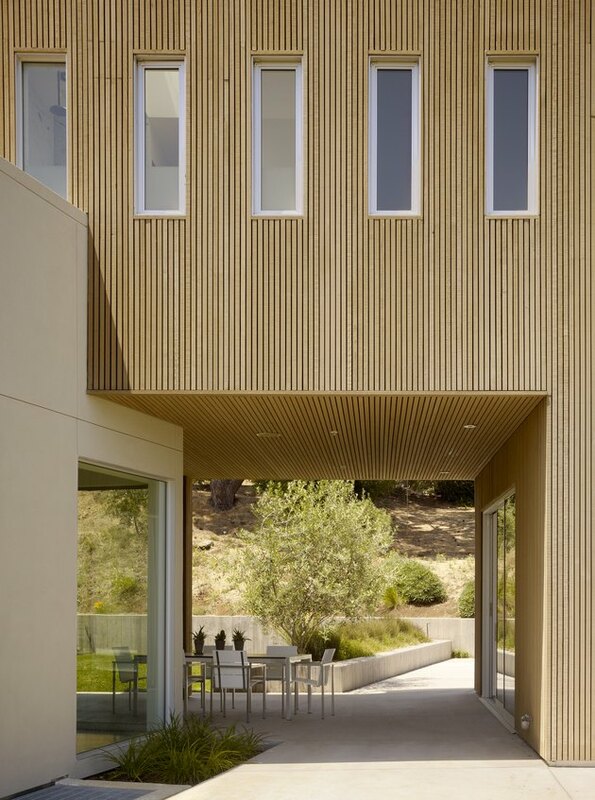 And when they hired CCS Architecture to transform land that was once an orchard into a property, they asked architect Cass Calder Smith for the process to be a joint effort. "I like to end up with two lists: one that is about aspirations for their home which is more narrative, while the other being about requirements," he said. In the end, they created a minimalist design that openly merges the outdoors with the indoors through interconnected breezeways and sliding glass doors. 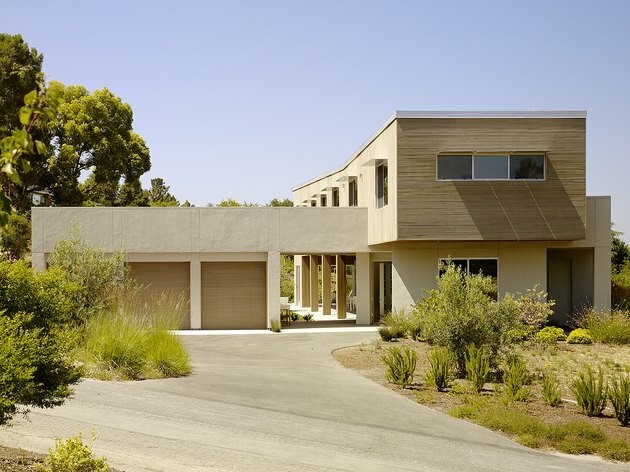 Smith and the couple also united on the quest to make the 6,000-square-foot house sustainable, so they chose materials that would decrease energy usage. The collaboration, Smith believes, was key to creating a great design. Now the family has the perfect haven to get away from it all, even though they live in the most technology-minded area in the country. The roof is built with structurally insulated panels, and the walls are insulated with cotton. Windows are shaded with perforated aluminum. The couple's dreams of dining outdoors in the shade were made possible by furniture from Arkitektura. 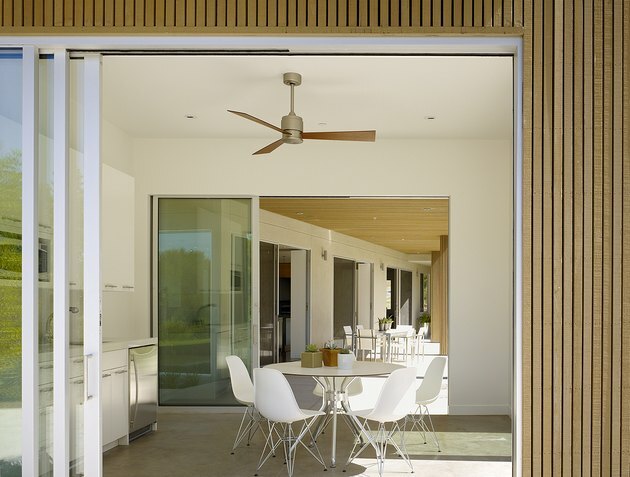 Warm summer nights can be made cooler by a ceiling fan from Modern Fan. 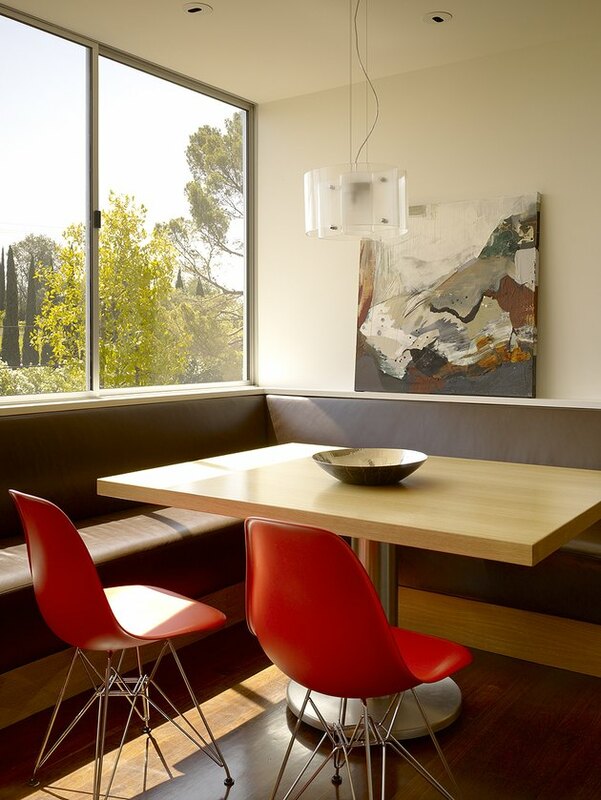 The homeowners host guests around a simple dining table adorned with Eames chairs. Interior designer Barbara Turpin-Vickroy outfitted the spaces with vintage midcentury pieces and new, minimalist designs. 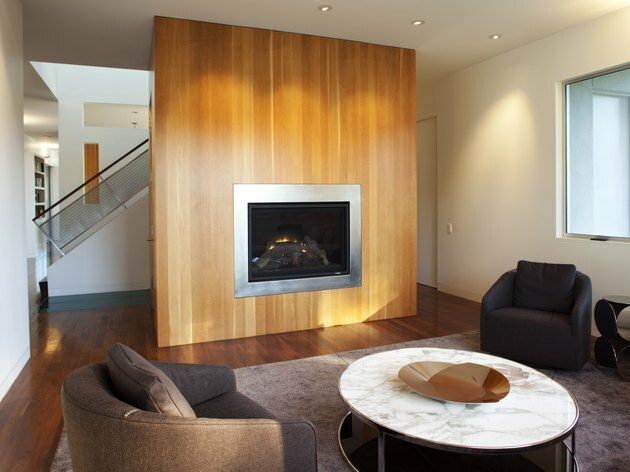 On cooler nights, the living room's sleek fireplace provides a cozy atmosphere. A Cross Extension Table from DWR stands over a Delinear rug in the dining room. Custom lights and artwork from Hang Gallery in San Francisco add detail to the space. 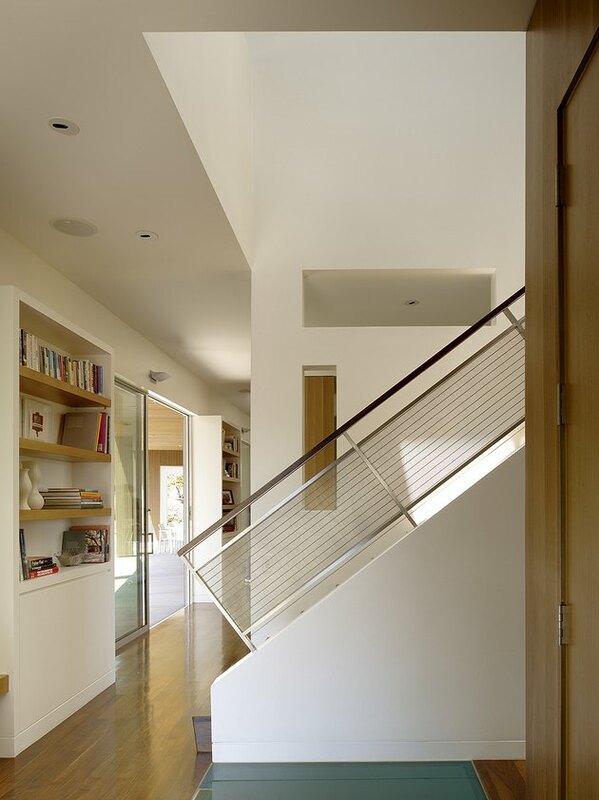 A thoroughly-modern stairwell was designed using wood, metal mesh, and stainless steel. An upstairs breakfast nook features a custom-built banquette and views of the backyard. The master bedroom features linens by Room and Board and bedside lights by Artimide. 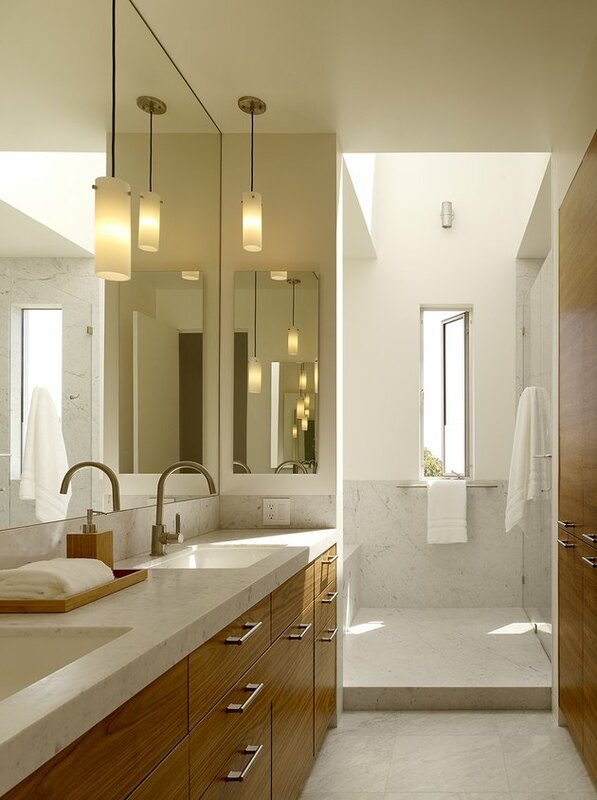 Pendant lights, along with a narrow vertical window, create soft light in the bathroom. 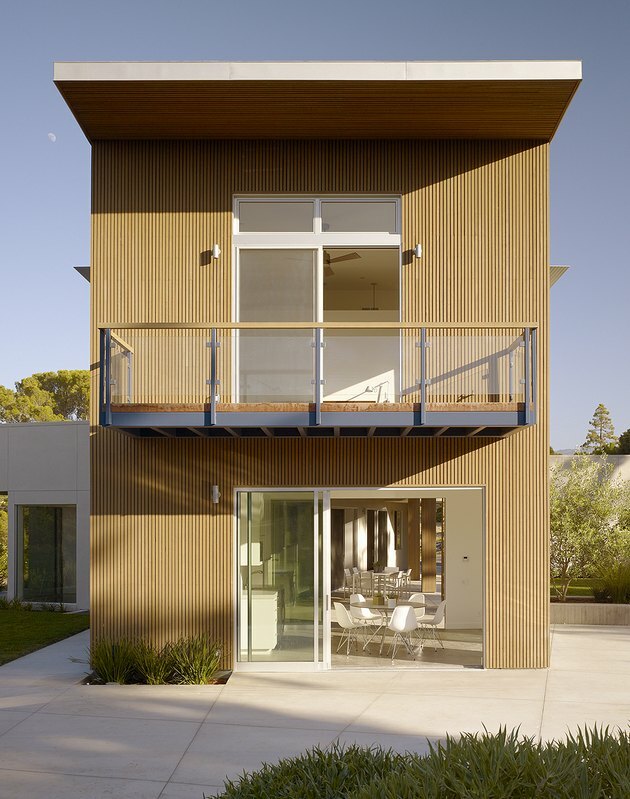 Wood, steel, and glass materials comprise the exterior's intriguing minimalist design. Two Architects Act as Their Own Clients to Build a Dream Property in L.A.